"Here is a great soup for those days when you need something that will warm your soul. 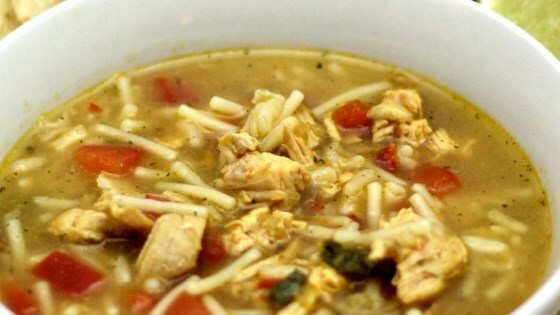 Ordinary and easy-to-make chicken tortilla soup becomes extraordinary with Mexican rice and a salsa verde kick." Measure water into a pot and bring to a boil over medium-high heat. Add chicken, Knorr(R) Fiesta SidesTM - Mexican Rice, red bell pepper, and salsa verde. Reduce to a low and simmer until the rice is fully cooked, about 10 minutes. Stir in lime juice, continue to simmer for another 2 minutes. Serve in bowls topped with crushed tortilla chips. I just love this recipe and make it all the time! It is so simple and quick to the table.